Lots of progress on these two guitars today! Marked out the neck, and got a truss rod. I don’t have a second truss rod so I’ll have to get one before I do the second neck. I like the ones from Allied Lutherie the most. Marked holes to drill for screws. And screwed down my acrylic template. It works much better than using double stick tape. The screw holes will be filled with glue and covered by the fretboard so they’re not seen. This neck pocket was flat originally, so it needed to be angled to match the neck plane angle of two degrees. And routed it. I wasn’t careful and I got a bit of tearout, which I’ll repair tomorrow or later tonight. MDF template for routing the body has to go on the back (which has no routes) so I used double stick tape here. Routed the body out. Sanded it later so its nice and smooth and clean now. Used the template to mark out the neck pocket. The tenon is actually shorter than the one on the template though. Screwed down the neck pocket template. Hogged out most of the material with the drill press and a forstner bit. Routed the neck pocket on this body also. And that’s it for now – tomorrow I’ll start in on the electronics routing on the mahogany body I think. I’m sure that many people in the electric guitar building guitar community have been aware of this website for quite some time – but for those who are not, I wanted to to a quick shout-out to let you know about Frank Montag‘s fabulous website. The website essentially consists of editors that allow you to design single cut and double cut guitars online. The layout is very user friendly, very effective – it allows you to build several formats of single cut guitar. 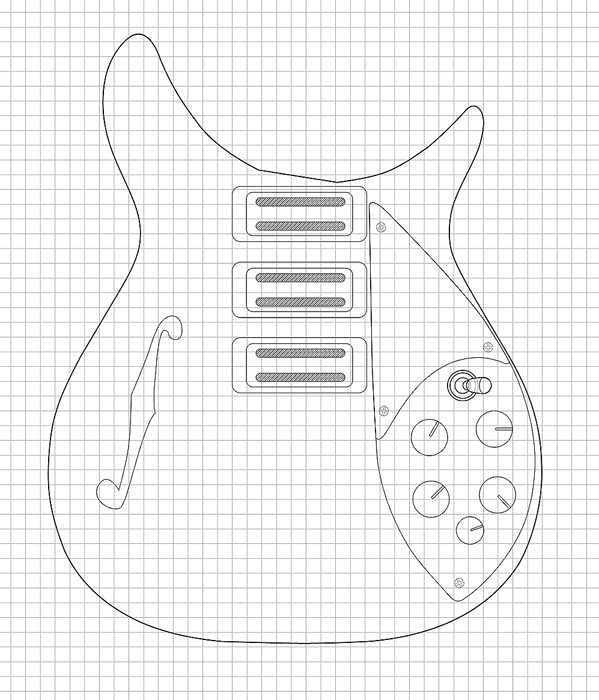 For double cut guitars, I believe you can only design a Gibson SG shape. The layout of the website is shown below – it allows you to change the colour, wood, hardware, inlays, etc. to make your guitar truly your own. You can access the website by clicking here. Cheers Frank Montag – great website!